A fabulously funny, profoundly heart-warming show featuring three generations of gutsy circus women. Casting Off is an all women, cross-generational show that challenges the conventions of circus and subverts expectations. 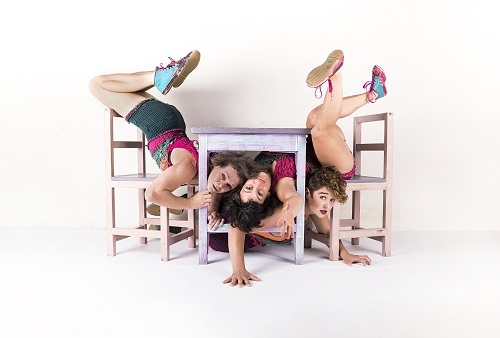 Casting Off challenges stereotypes, as three generations of gutsy women aged 30, 42 and almost 60, tumble, talk, fly, and balance precariously; where the personal is political, the furious is funny, and the acrobatics are downright dangerous. Self-directed, hand knitted and honouring the life events that get in the way of work, Casting Off is a fabulously funny, intelligent and profoundly heart-warming show. Set to a soundscape of the many disparate texts (lists, poems, conversations, melodies, arguments and biographies) that embody each day, Casting Off is circus and conversation in which the voice and the body are equally privileged. A GooD Catch formed in 2017 with the aim to experiment with circus. With a combined 82 years of performing experience they approached this new work with a commitment to organic discovery. They soon realised they had a lot to say, in fact they could be accused of talking too much. Emboldened by the Cocteau quote “What the public criticises in you, cultivate. It is you.” - their experiment found its form. Casting Off won the Total Theatre Award for Best Circus at Edinburgh Fringe Festival in 2018. Casting Off is a truly unique work as it crosses generations in a heartbeat and brings together three female acrobats who range in age from 30 – 59 years. Casting Off is suitable for young mums and dads, middle aged men and women and the children of ALL these people. The performers are strong and authentic women who will touch the hearts of women everywhere. It is a very relevant work. Interesting facts about the cast, 59 y.o. acrobat who can still do a flip and two acrobats that are mothers. Casting Off is relevant, skillful and beautifully crafted, a show to be shared amongst the generations. A show to bring your older children and your parents, to inspire and to start conversations on gender politics, age expectations, personal histories, life advice and the mental load. It celebrates strong, thoughtful and resilient individuals, a joyous accumulation of moments that shine a light on women relating to each other in playful, fruitful relationships. Post show Q & A's and Workhops 1. Girls only- Physical theatre workshop based on finding their voice, empowering them both physically and creatively. Looking at both physical and internal strength and the importance of being brave over being perfect. 2. For all- Improv / Drama workshop based on collaboration, communication, learning how to lead, follow, listen and add to other people’s ideas. Focusing on clear respectful communication between all genders. Both workshops end with a human pyramid where they use what they've learnt in a circus outcome. No specific requirements other than a good general wash including height up to 5m. Can adapt to in house lights. No audio required except playback for pre-show music. Set comprised of 2 tables and 3 chairs, and a crashmat that need a flat, even surface.